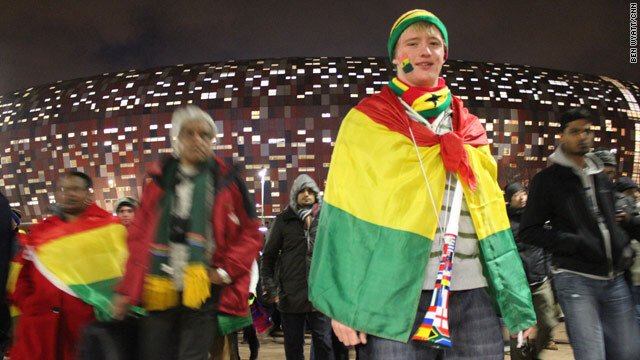 Ghana's World Cup dream is over but a large number of white South Africans turned out to support the west Africans. Ever since Pele boldly predicted that an African side would win the World Cup before the end of the 20th century, the race was underway for a side from the continent to deliver. African sides clearly missed the deadline the Brazilian legend set, but with the World Cup being held on the African continent for the first time in 2010 there was renewed hope the dream could be realized. Not only had a record six teams from the continent qualified - after hosts South Africa had their place safeguarded - African talent had arguably never been richer or to be found in more depth. But with Asamoah Gyan's extra-time penalty miss in Ghana's quarterfinal game against Uruguay, the chance to seal an historic berth in the final four for an African side went begging; a continent's hopes were dashed. The Black Star striker showed immense courage to regather his game to score Ghana's first penalty - in what would ultimately prove a doomed - shoot out to decide the tie. And Ghana too had performed above expectations to progress from their group and get so close to the semifinals despite being deprived of star player Michael Essien along with both captain Stephen Appiah and midfielder Sulley Muntari struggling with fitness. Of the other African teams questions must be asked. Bafana Bafana united an often fractious nation with good performances in two of their three group games, but ultimately, one of the highest paid coaches on the planet (Carlos Alberto Parreira) became the first to steer a host side out of the World Cup before the knockout stages. Cameroon finished bottom of their group, with no points from three games and were the first team dumped out of the cup. Samuel Eto'o - who was the official face of the 2010 tournament, and a recent winner of a treble of trophies with club side Inter Milan - surely hoped for more. Algeria had performed remarkably to even get to the finals, as winners of an epic qualification struggle with arch-rivals Egypt. The north Africans gave good accounts of themselves in clashes against England, USA and Slovenia. Unfortunately, for the Desert Foxes the gulf in talent was too much to be bridged, but they had opponents who were far superior on paper worried for a while. Ivory Coast, in typical fashion for the Elephants of late, failed to produce on the big stage. Talisman Didier Drogba was hampered with injury and the west Africans were drawn in a difficult group, but they were unable to upset the odds in any of their matches despite the wealth of experience coach Sven Goran Eriksson brought to the side. Last but not least are Nigeria. Poor performances and a hat-full of missed chances saw Aiyegbeni Yakubu et al stumble out of a tournament they had only qualified for by the skin of their teeth. To add salt to the wounds of the once proud Super Eagles, Nigeria's president Goodluck Jonathan then promptly disbanded the national team for two years in response to their poor showing. A crazy move that does not make good headlines of African football and will surely incur the wrath of FIFA - who deplore government interference in the beautiful game - as well as the millions of soccer mad fans at home. All-in-all, Ghana aside, there is still work to been done by African nations to turn the undoubted talent available to the various national sides into tangible progress on the world stage. However, one success that should be remembered from the 2010 event is how people of all races joined in support of a soccer team. It sounds so simple, but to see white South Africans waving Ghana flags and cheering on a team from west Africa in a location that only 15 years ago lived under strict apartheid shows that any dream has the potential to come true. the best game so far Uruguay vs Ghana.As a neutral I favoured the Uruguay side i certainly felt joy in 120th minute when Asamoah Gyan mised the penalty but later on seeing him cry like like baby I wished it had been otherwise. keep your heads up ghana i'm proud of you guys ,i believe the best of africa is about to come. Now it is enough! Sepp Blatter has to step down immediately! “But the way in which I was sent off (Friday)—truth is, it was worth it,” Suarez said. Why am I confused, Henry handled the ball, Maradona handled the ball and they were a disgrace but Suarez handled the ball and he is a hero(8.5 fifa rating)? He CHEATED!!! Suarez illegitimately robed the wholeAfrican continent from the semi final. He should be banned for life. For cheating so blatant that stopped an obvious goal, Ghana should have been awarded automatic win. Just my sense of fair play. Our hearts went out to Gyan. In any case it is my view that FIFA should have the balls to make exceptions. After all, Ghana deserved to win that game. FIFA should do some serious reflection after all the incidents watched on screens by millions of people over the past weeks. Do a vote and see how many are in favour of using the cameras in refereeing. Come on! It is NOT cheating, it is just knowing what the rules of the game are, and making a decision knowing what are the consequences, based on those rules. In this case, unlike Maradona's and Henry's cases, the rules where applied as stated in the books. Now, if the referee had not given the penalty or red carded Suarez, that would have been a different story. Let's say in a game of basketball with five seconds to go and the game tied, someone picks the ball and starts running towards the net unchallenged and I (being in the opposing team) commit a flagrant fould from behind. The guy goes to line and misses all his shots, and then my team goes on to win in overtime. Well, my foul was punished as it should, just like Suarez handball was, but I don't think in the first case most Americans would call that cheating. But well, this is just a matter of opinion. There was a time in baseball when throwing a curve ball was considered cheating, because the pitcher was trying to deceive the hitter. What a disgrace!... Today is obviously a non-issue, just like Suarez handball is a non-issue for most people around the world. Asamoah you have made us all proud. Ghana missed a golden opportunity to be the African Lion. I'm not much of a soccer fun, but this contagious ghanaian team got me watching it for the first time. After yesterday's game that clearly shows the black stars were rob, i'm never goin' to watch it again. Well done Ghana you made Africa proud. Gyan keep your head up!! Definitely stronger punishment needed for hand ball. I'm so sad for Asamoah Gyan who did so much for his team. People should not be crossed at him ; he did his best and was unlucky to hit the bar with that penalty, it's not as if he was lackadaisical taking it. And let's not forget for those who easily criticize that taking a penalty in this context with 120 minutes of world class football in the legs is no easy task physically or psychologically. The same goes for Mensah and his incredibly weak shot in the shoot out. We, Africans & Asians are very proud of our teams performances. Naturally, we are not as highly professional like those of Europeans and South Americans but we are coming along and shall be sucessful in the coming 4 years. PS: Beside, we also needed to master our penalty shoot-out. In soccer matches,hands are being used by goalkeepers and other players during throw-ins. To make the game true to its name,I think we should have kick-ins rather than throw-ins and the goalkeepers must kick instead of throw or lob the balls away. Goalkeepers may use hands only when trying to save . To ensure they play only with their feet,we handcuff all the players. That will be great right? You cheat to progress in a tournament and attribute it to the 'hand of God'. That the worst comments i have ever heard my life. I think Fifa should change the rules to goal awarded and a red card to the offender or else someone will do it again to cheat. How come the referee only gave a yellow card to Suarez? Ghana won the match but was cheated in the very presence od Sapp Blatter had his friends. Where is FIFAs fairplay policy. IT IS A BIG SHAME TO ALLOW THIS DAYLIGHT CHEATING BY SUAREZ SUPPOTED BY THE REFEREE AND ACCEPTED BY FIFA. May be Africa should stay out of this cheating until truth prevails. Cheating??? That wasn't cheating AT ALL. People, if you do not understand what futbol is, please don't comment. Obviously none of you have ever played futbol. What happened on the court was completely under the rules. I have been in the same situation as Suarez. It is an instinctive reaction which has a penalty applied. He played with the rules. Ghana also played with the rules. For example in other games of this World Cup, Ghana played with the rules by delaying the game, faking injuries. Is that cheating? NOT AT ALL. That is being smart, that is playing with the rules, that is knowing the game. That is what the American team lacked and probably why they lost. The bottom line is that what Suarez did was not cheating, it was an intelligent and quick heroic decision. Ghana had the opportunity to score with the penalty kick, but they fail. Bad for them, good for Uruguay. FIFA should take a good look at what Suarez did and come out with a better solution because players like SUAREZ and others intentionally do that just to win matches. FIFA WE WANT FAIR PLAY, THIS IS CHEATING. step by step, africa will get there. FIFA PLEASE SAME LIKE RULES IN FOOTBALL GAME. I MEAN INJURY TIME MATCH BETWEEN GHANA AND URUGUAH . THE BALL PREVENT BY HAND OF BACK WINGER IN GOAL POST IS NOT DESERVE WINNER POSSITION. ALLOW SHOULD GAOL TO GHANA. OR CHANGE THIS RULES FOR FUTURE GAME. NOW VILLAIN IS HERO!!! THIS IS FIFA'S BIGGEST FAULT EVER. FIFA PLEASE CHANGE SAME LIKE RULES IN FOOTBALL GAME. I MEAN INJURY TIME MATCH BETWEEN GHANA AND URUGUAH . THE BALL PREVENT BY HAND OF BACK WINGER IN GOAL POST IS NOT DESERVE WINNER POSSITION. ALLOW SHOULD GAOL TO GHANA. OR CHANGE THIS RULES FOR FUTURE GAME. NOW VILLAIN IS HERO!!! THIS IS FIFA'S BIGGEST FAULT EVER. i am a Ghanaian,i think what suarez did was not cheating.He blocked our chance and the referee gave us another which was even a penalty.luck was not on our side so we missed it.kudos to the black stars of AFRICA!indeed! IT´S ONLY IN SOUTH AMERICA THAT PEOPLE ARE HAPPY ABOUT THIS SOCCER ROBBERY.BUT IN ASIA EUROPE AND IN AFRICA PEOPLE ARE VERY SAD .ARGENTINA DID IT, BRAZIL DID IT AND URUGUAY JUST DID IT.ALL WENT UNPUNISHED.IS THIS FAIR PLAY ? THE ONLY COMPENSATION FOR AFRICA IS TO INCREASE IT´S PARTICIPANTS TO 8 TEAMS BUT THIS WON´T HAPPEN BECAUSE THE FIFA MAFIA KNOWS THE CUP WOULD FIND A NEW HOME IN AFRICA.SOUTH AMERCAN TEAM ARE ALWAYS SCARED OF THEIR AFRICAN TEAMS.THEY ALWAYS USE FOUL MEANS TO WIN .ALSO THEY ARE ALWAYS FAVORED BY REFEREES AND FIFA.IS IT BECAUSE AFRICANS ARE TOO BLACK. Suarez sacrificed for his nation just like any other player of European, Asian or South American lineage would do. Ghana displayed same tendency for Africa and played their hearts out. Africans should learn to leave all out on the field using every means necessary. Its the pride of your nation and Africa. Be indomitable and fly like an eagle. Fear no one and exhibit class unlike Sani Kaita. Africa is proud of our Black Stars. I WOULD LIKE TO START, BY SAYING,,THAT FIFA NEEDS TO GO BACK TO THE DRAWING BOARD.BECAUSE IN BOXING IF A BOXER DO NOT BOX BY THE SET RULES HE/SHE GETS POINTS TAKEN FROM THEM.THE STANDARD TEN COUNT AFTER A KNOCKDOWN,THE UNDER THE BELLY BLOWS.AWARDING A PENALTY.IS JUST 1/2 I MEAN A 50/50 CHANCE OF GETTING A GOAL . IN BASKETBALL IF A PLAYER IS FOULED IN THE END ZONE THE OTHER TEAM GETS 2 FREE THROWS..... I PERSONALLY THINKS FIFA SHOULD DO SOME SERIOUS UPDATING OF THE GAME RULES......ONE ...IT COST ALLOT OF MONEY GETTING JUST THE TICKET +WHERE TO STAY AND SO ON AND SO FORTH......JUST 2 WATCH A cheat CUP INSTEAD OF A WORLD CUP. Maxwell Akrobettoe, have my acknowledge for such a fair interpretation of the football. By the way, there is something almost nobody have mentioned: there are two Ghana's players in offside since the beginning, so the whole move was no valid. So, Uruguay should be complaining, because if referee had done his job, Suarez reaction should no be punished with a penalty shot and a red card and one match ban. But referee did wrong. Now, Uruguay missed one of his best players to the final matches. God doesn't like wrong doing, so that's why Uruguay made it at last. What a bunch of nonsense...IC failed to delvier...LOL...right, they had the HARDEST draw in the tournament...name me somebody who had it tougher?!??! And Ghana loss on a foul play...Uruguay didn't "cheat" as many have said, but they clearly deserve to lose the match, as they loss on nearly every account. Look at Ghana's performance against Germany...which has BLASTED so many teams, including England and Argentina. I'm not sure why all of these writers are so keen to put Africa on a different pedestal...Asian countries when treated to this same scrutiny when the WC was in asia...hmmm...Double Standards again for Africa...pathetic. So if a South American country doesn't win next, the continent will have failed right...this quick push to damn Africa is really getting old...really old. More and More Affrica players are playing at the top level in Europe...I don't see any non-African players on African national teams, but have you looked at others rosters...keep trying to damn Africa...and you'll be daming them when they win one f the upcoming WCs! BRAVO/ BRAVO/ BRAVO//////FIFA I DO NOT REMEMBER THAT HISTORY WAS GOING TO BE REWRITTEN NOR DID I EVER WISHED IT SO,BUT THE FACTS REMAINS THAT I WILL NEVER AGAIN INVEST IN ANY FIFA ACTIVITIES..........THIS IS NOT AND NEVER WAS THE PEOPLES GAME,THE WAY I SEE IT,THIS THING CALLED FOOTBALL HAS TAKEN A VERY DIFFERENT CENTER STAGE AND NOT BEING TRUE TO THE GAME.FIFA NEEDS TO DEVELOP A CLEAR SENSE OF HONESTY LAST BUT NOT LEAST GET RID OF ALL THOSE BLIND REFEREES. comments can come from all conners of the globe,dimming or appraisal,others my turn off their tvs or put the socalled silencers,we might be the so called developing country,lastly we might have failed to qaulify for the second round on our home soil,but our biggest winner the VUVUZELS has made it to the final,this is the legacy the soccer world cup will carry for many years to come,for once one thing has been invented in South Africa and is purely and proudly South African the VUVUZELA.......S.
This is the same kind of article that was written when Cameroon got in the WC some 16 or so years ago. As long as the football authorities in the African countries mis-spend money, either stealing it or wasting it on some so-called great opportunity for the youth of their country, the state of African football will not change. The really good players will leave to go to South America or Europe, and by-and-by will refuse to play for their country, since the other players in their national side aren't good enough to play overseas let alone on the world stage. Bafana was lifted by the media and the film that came out recently, Invictus, and suddenly everyone thought they would pull off the same stunt that the Springboks did. Imagine my shock and horror, when they didn't (sarcastic). Germany spent the last 15 years building a foundation and the proof is the present team. Half of the young players came through the football schools that the DFB (German FA) has built around the country. there are more young players in the system watching the games and taking up the challenge. If players as young as Mueller can be produced by a football school then they must be doing something right. Lahm, Podolski, Klosse, Schweinsteiger may have one more WC in them, but even if they don't, look at who is ready to take over for them. If African football, even US football, is to improve to the point where they not only produce world class players but world class who can play well together they must institute the same kind of changes Germany did after 1990. Did you read about the Poor Man's World Cup being held in Cape Town? Here is a funny, but thoughtful article that really helps call out the issue (again, using humor to get the message across). Through cheating, a country can proceed further – do you remember the hand of God by Maradona, that touch by Henry that send the French into a fiasco, and now Suarez whos magical cheat led to Ghana loosing the goal that should have decided their fate in the World cup. I saw Suarez laugh when Gyan missed the penalty. That told me everything about all that is wrong with the beautiful game. There are no rules to reinforce fairness! Untill those rules are in place, then Blatter could speak of fairplay. Otherwise the rules as of to day do reward cheaters like Suarez and many others mentioned here! This Ghana team has brought live and drama into the World Cup and it is a big shame they should go out this way. Suarez was behind the goal line he committed his shameful act and the referee should have awarded a straight goal. As it was Ghana did not benefit from his send off. How will Uruguay feel and fare as they play Netherlands on Tue. cheats normally don't go far and end up being disgraced. In my view the referee should have awarded a goal to the Black stars. after all Suarez had nothing doing representing the Goalkeeper. when the keeper was beaten and the players could not stop the ball with any part of their body except the hands, the only thing left was a goal. I also agree to others who suggest that a player like Suarez. who after such an incident openly jubilated when the penalty was missed, should be suppended for a year or two from the game, not just a red card and two or three matches. Fifa must consider this very wrong precdedents. Uruguay played as per the rules of the game. Ghana should have Won the game as a common sense. FIFA should consider modifying the rule to – If the last line of defence (apart from the goalkeeper) does a deliberate hand-ball to prevent a goal, Goal should be awarded to the other team and the guilty player should be shown a Red Card. FIFA should not aim at making the game popular by creating controversies but by ensuring the game is played in a FAIR manner and uphold the game as the Most Popular game for the mankind. Seeing UNFAIR actions leading to WINs makes people believe that Life also is UNFAIR as the game. IS THIS VOLLEYBALL OR HANDBALL??? HEY, IT'S A SLAM-DUNK IN BASKETBALL, AIR-JORDAN. HAHAHAHAAA FIFA PAA, and the swine gets only 1 match ban. Why will somebody else not do it the next time? FIFA, prepare, cos there are going tobe more keepers than players on the field. No more goals will be scored. SHAME ON FIFA AND and the CHEAT, DEVIL suarez. A rival football organisation such as is done in Boxing will solve all these problems. The most controversial world cup in history was held in Africa. Why can´t the world stop insulting our intelligence. I think FIFA should revise their rules and ensure that any player whose hands touchs the ball whils standing on the Goal line should be red carded and a goal also received agains it team. Look at how suarez jubilated after the miss by Gyan. A replay of suraez act indicates deliberate act yet ther boost about it. Children are watching. Players holds hands of children to the field prompting them that children are watching them. Football is a beautiful game but it looks like we may spoil it if we do not change certaing rules. The world has advance and is about time goal line technology is introduce. Sorry to Ghana, England, USA and all who sir blatter has sat down for them to be cheated in 2010. Ghana in my heart is a true warrior and a winner of 2010 world cup. Sir Blatter and his unchanging rules prevented a true team (GHANA) to be a WORLD CHAMPION. My GOD i hope all the world saw what happens to Ghana my country we were rod . but all is not lost yet , Shame to does who are do that . your flagrant foul analogy is flawed...If anything, in basketball goal tending is automatic points. In Ghana's case. That was a SURE GOAL. In this case you're taking away an automatic goal and replacing it with a penalty that's got a 50/50 chance of going in. Players miss penalty shots all the time. Even good players do. FIFA needs to change that rule or teams are going to incorporate it into their game plan. Think about, 2 mins left in the game you're up 2-1, sure goal going in, you punch it away, eat the red card and take your chances with the penalty taker. You miss the last 2 mins of the game and the next. Big deal. Teams play 10 men and still hold their own. And there's so much talent sitting on the benches these days, even impact players arent missed if all they're missing is one game. We live to fight another day. we never say never Ghana Black Stars we are proud of you for lifting high the flag of the Nation and that of Mother Africa. Watch Out Brazil 2014 because we coming bigger and larger in charge. Black Stars you are still our Hero's!!! Proud to be an Africa. I just hope the other Countries of Africa will join in more for the next world cup. WE WILL BE THERE. Let face fact as a people uruguay dont deserve where they are, we should not condone cheating. Fifa should change its rules so that cheaters like the uruguan player will not be rewarded for cheating. l dont think uruguay will pass the semi final stage. They dont play decent foot ball and they dont even have a good team. they made the whole africa proud , even our own legend Nelson Mandela was also happy. To me good that, the Dutch scored the Uruguay. You know ; is every good and God works in many way to deliever his children thank God .And telling you they wont even placed third, they are going to be at the bottom. On July 5th Mohammad Al Hassan Ibrahim said that this is the most controversal tournament in World Cup history. Stop it, go back a read the history of the world cup, There is the "hand of god" goal, a detector picking referee, ref passing a ball to opponent to score, Match fix in Argintina, where did you come from with Most controversial tournament. Obviously a lot of people love watching soccer matches, even ignoring basic rules of the game. First at all, there were two Ghana's players in offside, so Suarez stopped an illegal shot and, if referee has done his job correctly, nothing should has happen. If Suarez would not stop the shot and Ghana would scored a goal it was supposed to be invalidated, because the offside of those players. At the end was Uruguay who got the unfair, because referee didn't saw players in offside and showed a red card to Suarez and gave a penalty kick to Ghana that was undeserved. We all love soccer, but besides our fan side we must be honest to the game.